“Gorenje Simplyfans” (Gorenje, d. d.), “Alpsko mleko & Ilka the Superhero” (Ljubljanske mlekarne), “Priprave” (Volkswagen Ljubljanski maraton), “Let’s compete together” (Petrol, d. d.) and “Tour of Slovenia 2018” (Cycling club Adria Mobil Novo mesto) won four categories and one subcategory at the SPORTO Awards 2018 as the best practice in sponsorship and marketing in the Adriatic region. The best projects from each country, participating in the SPORTO Sponsorship category, qualified directly to the ESA Excellence »Best of Europe« competition. You can find information about all entered projects for SPORTO Awards 2018 here. 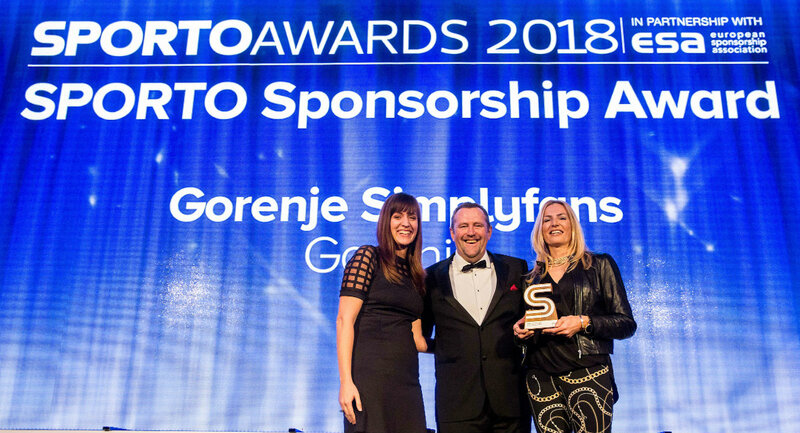 The SPORTO Awards perfectly illustrate the capability of brands, rights holders and agencies to deliver against the strategic goals of businesses in the region and as a shop-window of best practice. The range, from all across the Adriatic region, covers integrated programmes engaging brands with fans through their passion points of global sports to community activities, from healthy living campaigns to direct sales drivers and targeting from the very young to more mature audiences. The Jury noted that the shortlisted projects were excellent examples of sponsorship and these are two finalists in addition to the winner: Laško x #ToLegende (sponsor: Pivovarna Laško Union) and VW Marathon – Clean Power (sponsor: Porsche Slovenija, Volkswagen). The Jury shortlisted two finalist in addition to the winner: Davo Karničar and Ford Ranger (sponsor: Summit motors) and #vztrajam (I Never Give up) with Maruša Mišmaš (sponsor: SKB bank). Digital category had the biggest number of entered projects and the jury selected two finalist in addition to the winner: Laško x #ToLegende(sponsor: Pivovarna Laško Union) in VW Marathon – Clean Power (sponsor: Porsche Slovenija, Volkswagen). Other two finalists in this category are Cedevita 3×3 Ljubljana Challenger (sponsor: Cedevita) and I Feel Slovenia Ironman 70.3 Slovenian Istria 2018 (entrant: SBR Sport). Mascot Foksi and Slovenian Pyeongchang 2018 (both projects entered by Olympic Committee of Slovenia) were two finalist in addition to the winner in this category. Jury also awarded the project be Stronger Together (sponsor: Allianz Croatia, rightsholder: Croatian Paralympic Committee, entrant: Allianz Croatia / VETTURELLI consulting) with ESA Award presented for innovation, creativity and best practice. Projects from each country of the applicants which received the highest score in the category of SPORTO Sponsorship Award are qualified for the competition of the European Sponsorship Association (ESA) in the category “Best of Europe”. The best Slovenian project: Gorenje Simplyfans (sponsor: Gorenje d.d., rightsholder: EHF Marketing GmbH (VELUX EHF Champions League), Infront Sports & Media AG (EHF EURO), entrant: Gorenje d.d.). The best Croatian project: beST – be Stronger Together (sponsor: Allianz Croatia, rightsholder: Croatian Paralympic Committee, entrant: Allianz Croatia / VETTURELLI consulting). Entries in all SPORTO Awards categories were reviewed and evaluated according to predefined criteria in close cooperation with European Sponsorship Association (ESA), by an international expert Judging Panel chaired by an ESA representative Toby Hester (Sponsorship Coach). Other members of Judging Panel were Aleksandra Graovac (PR & Communication Specialist at Toyota Serbia), Vlatka Kamenić Jagodić (Deputy Director of Marketing & Business Strategy Department at HEP), Neil Morley (Managing Director at Cat’s Eye Communications, Slovenian Marketing Association representative), Viktorija Radojević (Director of Marketing and Development at Mercator), Uroš Stanić (Marketing Manager at FC Rijeka), Maja Oven (Head of Marketing and PR communication at BTC), Ana Šušteršič(Creative Director at Agencija 101) and Dijana Vetturelli (Managing Director & Partner at Vetturelli consulting).